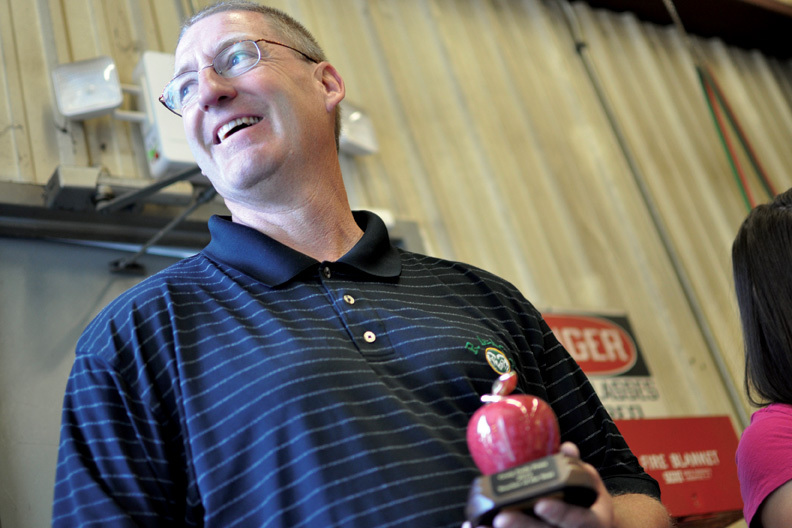 John Haddan, a Moffat County High School agriculture education instructor, smiles Thursday morning after receiving the 2012 Teacher of the Year award from the Craig Daily Press. Haddan has taught at MCHS for about 15 years. John Haddan didn’t see it coming. When the Moffat County High School agriculture education instructor first learned Thursday morning that he’d been named the 2012 Teacher of the Year by the Craig Daily Press, his face registered astonishment bordering on disbelief. He was “extremely surprised,” he said. That was the point. Every year, the newspaper’s editorial board selects one teacher for the award from a list of names submitted by the community. After selecting the winner, board members present the award to the teacher, unannounced, during class. Work in Haddan’s ag construction class gradually came to a halt as his students and Vicki Haddan, Moffat County School District technology coordinator and his wife of 26 years, watched him accept the award. Gradually, his expression softened into a smile. Lawrence Sober, a Moffat County School Board member, nominated Haddan for the award, citing the teacher’s past presentation to the school board about how the ag program integrates math, science, engineering and art skills. “I believe that (Haddan) is dedicated to his profession and has the ability to share his experience and insight to prepare his students for a better future for both them and the future of this community,” Sober wrote in his nomination form. Haddan’s education career has deep roots in rural communities. He worked as a Colorado State University cooperative extension agent in Crowley County before beginning his teaching career at Crowley County High School in Ordway, a small town east of Pueblo. He’s taught ag education at MCHS for about 15 years, and his range of classes — from horticulture and animal science to ag business and welding — requires a broad knowledge base. Haddan isn’t one to crave the spotlight, preferring instead to deflect it onto others. “If I had my vote for teacher of the year, it would be Mr. (Rick) Murr, my co-teacher up here at the high school … because he’s done an outstanding job,” he said. And instead of dwelling on his own contributions to the school, Haddan preferred to put the spotlight on the ag program and the MCHS Future Farmers of America chapter, which he advises with Murr. His duties in the latter extend beyond the last day of school as he helps FFA members prepare for the Moffat County Fair, he said. To MCHS Principal Thom Schnellinger, Haddan’s workload during the summer speaks to his devotion as an educator. “His commitment extends far beyond the classroom in terms of our children’s education,” Schnellinger said. He echoed Sober’s words. Students apply math and science lessons in the ag building next to the high school, the principal said. Haddan’s students may use the Pythagorean theorem to construct an outbuilding or draw from their biology classes when they’re in his animal science class, Schnellinger said. Haddan wants his students to leave his tutelage with “a good working knowledge of agriculture,” he said, but he also hopes he’s able to teach them skills they can use as leaders, in business and in all of life. “We just want to prepare them to be successful,” he said. Justin Stephenson, a MCHS junior and one of Haddan’s students, vouched for the last quality. “He’s more like a parent to us, really,” he said. As Stephenson described it, Haddan demands excellence from his students, pushing them to complete projects correctly on the first try, yet he also fosters patience and tenacity. His message from his teacher is simple: Work hard, ask for help if you need it, “and really just try your hardest at life,” Stephenson said.